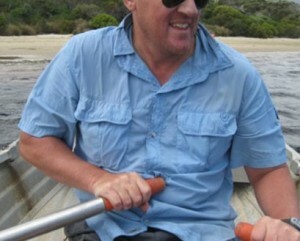 My name is Brendon Sinclair and in January 2010 I completed the South Coast Track walk with my 2 sons – 17 and 15 – and brother-in-law. He’s really old. 46. 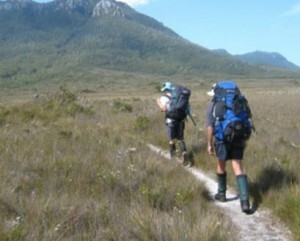 Of course, you don’t have to do it yourself – South Coast Track expedition experts offer a fully escorted and sorted package that takes care of everything. I look forward to seeing the info and photos, learning about the track and inspiring me to get fit enough to walk it too. it was great spending time with ya’s on the track, especially loved the beers on day 3 and 4 … Oops, other people might read this and it would give them the wrong impression of the track, that there is a pub on day 3 and 4 or you can actually have the strength to carry beers. Loved your photos, we will send you ours. Thank you Brendon for the site. Im just about to do the walk and what you have here has made it a lot easier to plan. I learnt a lot about the walk from other sites and photos and thought one big site with tons of info would be really useful for visitors. Only 7 days. What was the rush? Getting from point A to B is such a small part of this walk as there is so much to see and experience along the way. 10 days should be minimum ! We actually planned for 10 days, but found 7 was just fine for us to do it comfortably and smell the roses along the way. It is a great walk with so much to see and do. Dear Brendon, looks like it was a very good decision to pass over the domain name to you .. well done .. top information for everyone to use for this great trek across the bottom of Tasmania ..! You wouldn’t believe it but I was just on the site looking at what I can do next to provide better information. Can I use that great image you have? I’ll pop that on the front page and into the big rotating image section too if that’s okay. And shoot through any links to your great photos and I’ll link over. Of course you can .. that Lion Rock picture has been published all over the place last year and is now available exclusive to your online visitors to http://www.southcoasttrack.com.au ..! If you set up a dedicated RED BUBBLE photo album for the south coast track i will give you a couple more pics that you can sell .. like a form of contribution for the upkeep of your web site .. that way others might also want to do similar gratis/ sponsorship contributions? In any event let me know and I will take the Watermark off that Lion Rock picture. Just a suggestion .. if you want to set up an annual working group to hit parts of the track each year (maintenance) .. let me know and maybe we can joint-venture with Parks & Wildlife? One other idea as well .. there are many people who want to walk this track but can’t get the planets lined up with their usual walking partners .. maybe some form of departure date idea could be worked into your web site that shows other people who is leaving and when and how many in that party .. (then they could communicate with each other via their own private emails) .. sort of like an introduction service? It is NOT a good idea at anytime of the year to do this walk on your own (too much can go wrong very quickly with the weather, etc,.) and ideally should be done with a minimum of four in each party. You and your sons were very lucky with your week .. I have never been that lucky with major storm fronts seemingly coming out of nowhere and not much time to find a camp site and get bunkered down! Great site and very informative. Myself and four others walked the track in late March and felt that prospective (especially inexperienced) walkers should be aware that the walk is very strenuous (a great deal harder than any of us expected) and usually VERY muddy, particularly in bad weather. You obviously had very beautiful weather judging by your photos which show the views alot better than ours! Yep, that photo is a cracker. I won’t go the selling/donation path as yet – but will keep it in mind for later. And I won’t have any time for a working group in the next year or so – will review that one later. And a good idea re adding a resource so people can add details. Will find a solution for that – a forum is often okay, but the amount of spam and hacking they attract generally make them a very time intensive solution. Glad you found the site useful. Yes, the walk is pretty tough and it would be really tough in bad weather. I’ll edit that site to push this point a little more. Seem to be selling plenty of the South Coast Track books at the moment, with lots more visitors to the site. Wouldn’t want to be there at the moment though (!) – August 17, 2010 – with reports of plenty of snow in Southern Tassie. I did the track solo in January 2011 over 8 days. In preparation I did a lot of research on the area. I just wanted to say I found your website extremely informative…track notes, maps and guide book recommendations, packing suggestions…and led me on to other sources of information. Thanks! The track was absolutely amazing and I’ll definitely be back. Thanks for the comment and thanks for the kind words about the site. I tried to develop the site based on the info I went looking for and what I found most useful. That was more practical stuff like the Gear list, photos of what we took, bit of info about us (i.e. when you see how unfit I am you get some confidence!). Thanks again and hope to bump into on the track when we next do it. Glad you enjoyed the walk – it’s a beauty. I’ll be going back in January with my wife I think. Thanks for the suggestion too re the updates. Will figure out a way to do it (forums tend to get spammed to death and they take a lot of work to keep clean). Sorry, didn’t see this comment. Neil left the Pit last year after about 20 years of driving trucks. Enjoy the walk – sure you will! Sorry, no help on the detour to Precipitous Bluff from Prion Beach. No one I’ve spoken to has mentioned it. Hope you enjoy the walk and would love your comments when you get back. 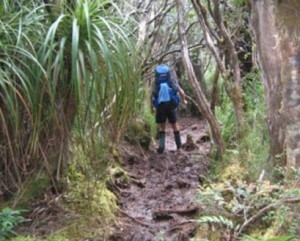 Just got back last Sun the 12th Jan from doing the South Coast track, over 7 days. Mate have to say the track has declined a bit over the 2 year period since I did it last, A lot of fallen trees over the track, and the mud is still there LOL. We had a very windy/wet day crossing the Ironbounds we estimated around 70 knot winds on top. And a wet trip down the other side. 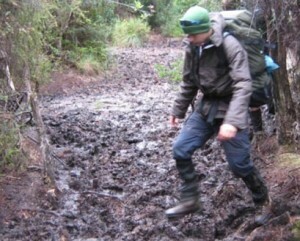 The mud was something else slowed us down a bit. But in all had a great time, but in saying that it was good walking out on the last day. To ask would I do it a third time?? Ask me in a few more years LOL. 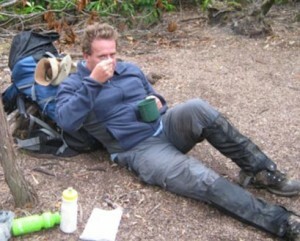 South Coast track is a fantastic walk, but you do need to be prepared. Hi, just have to tell you how much I’ve enjoyed checking out your site – gave me some good chuckles. 🙂 Will also use it if I end up doing the track like I’m considering! Thanks for all the great information. My husband and I who are also in our 40’s are considering doing the track this Christmas (2013). I am a bit hesitant, but after reading your website I think it would be a great adventure. 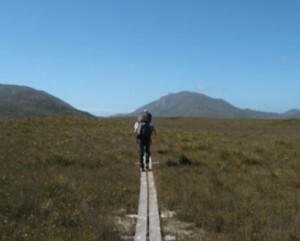 We’ve previously completed the Overland Track a couple of times and just love the Tasmanian landscape. A friend and I just got back from going the Track in late April / early May and I used your website extensively as a trip-planning resource beforehand. Thanks very much for maintaining it. We chose to walk in and fly out, on advice of a friend (I planned in a couple of days contingency and got a food drop to Melaleuca to meet us). It was ‘interesting’ getting around Black Cliffs even at half tide. We also got delayed a day at South Cape Rivulet near the start, due to rain (I went in over my head with pack on; slipped off a rock while testing the creek). Very memorable, and I’ll head back in Summer one year. The South West Cape circuit looks interesting, and so does Precipitous Bluff. We have booked our flights to Hobart and are just starting to plan our itinerary for the South Coast Track between the 23rd and 30th December 2013. We were going to stick to the same camps as you guys did, but looking at the tide charts that may be difficult. Did you plan your trip around tides? For readers planning a trip, I couldn’t find anything on the Tassielink site about the bus out of Cockle Creek but Evans departs Cockle Creek at midday Mon-Fri. $80 to Hobart. Last time I tried the website was offline. Their contact number is (03) 6297 1335. Thanks for the comments everyone. I’m pretty sure I’ve responded via email to people as the comments come in. Apologies if I’ve missed anyone.